The most highly developed agent in the V series is called VX, with the "V" standing for "venomous." This agent was concocted in 1952 by Ranajit Ghosh, a chemist working at Britain's Imperial Chemical Industries. The creation of the chemical was an accident, for Ghosh was merely researching for new ingredients to be used as pesticides and never expected to develop such a potent chemical. It was initially sold in the United States under the name of Amiton by the Imperial Chemical Industries in 1954, a mere two years after being discovered. When it was realized that Amiton was extremely deadly to not only animals and insects but also humans, it was taken off the market. Shortly afterwards the American military and Britain's chemical weapons agency, Porton Down, initiated its use as a chemical weapon and changed its name to VX. Today, only licensed citizens and the government are allowed to maintain possession of the nerve agent. It is ten times as powerful as chemicals in the G series. The nerve agents within the G-series were first created in the 1930's. They received their name from the group of German chemists, headed by Gerhard Schrader, who first synthesized them. The nerve agents that make up the G series are tabun (more commonly known as GA), soman (GD), cyclosarin (GF) and sarin (GB). Schrader and his team of chemists initially manufactured tabun (GA) in 1936, and shortly followed up with the creation of sarin (GB) in 1938. Afterwards, in 1944, soman (GD)came to existence along with cyclosarin (GF) in 1949. All nerve agents in the G-series are considered nonpersistent, which means that they are unable to exist for extended amounts of time under natural conditions. Although chemicals in the G series are the weakest type of nerve agent, these chemicals are considered some of the most noxious warfare agents ever created by man. During the final days of World War II, the Allies seized and destroyed many of Germany's weapons, including top-secret nerve agents German chemists had attempted to hide from the outside world. During this process, many of the chemical formulas for the agents were discovered by the United States, Britain and Russia. Once the chemical formula for VX, a member of the V-series, was made known to the Soviet Union, Russian chemists immediately began testing the nerve agent. Thus, the Novichok (Russian for "newcomer") Agents, or foliant agents, were developed in the late 1950's. The Soviet Union continued to secretly experiment on Novichok Agents well into the 80's and 90's, despite Russia's promise to NATO to declare all supplies of nerve agents. This activity persisted until an anonymous scientist revealed Russia's experiments with Novichok Agents to the media. Novichok Agents are by far the most toxic nerve chemicals, exceeding the strength of both the G series and the V series. Nerve agents are highly toxic to humans, and can induce paralysis in many cases, as seen in this picture. One of the first signs of exposure to nerve agents is miosis of the eye, which is the contracting of the pupil. A sharp or dull pain around the eyes or front of the head, dimness or blurriness in vision, nausea, inflammation of the conjunctiva, and occasionally vomiting take place shortly after exposure. A sure sign of the presence of nerve agents in the air is rhinorrhea, which many refer to as a "runny nose." The strength of the rhinorrhea is directly proportional to the dose of the nerve agent. 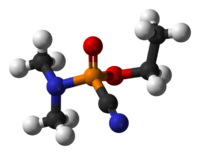 A 3D structure of Tabun, the first nerve agent ever synthesized. 1st Video: Description of VX Nerve Gas. 2nd Video: Military Video (1964) Explaining the Effects of Nerve Agents, Including a Death Scene of a Goat. ↑ 1.0 1.1 1.2 1.3 Nerve Agents toxipedia. Web. Accessed May 27, 2013. Foley, Shaun. ↑ 2.0 2.1 2.2 2.3 Unknown Author. Nerve Agents Fas.org. Web. DateAccessed 20 May 2013. ↑ Amiton Cornell Bio Chem. Web. Accessed May 27, 2013. Sadie. ↑ Gerhard Schrader. Toxicpedia. Web. Published April 3, 2013. DeCarvalho, Juliana P.
↑ Nerve Agents. ORGANISATION FOR THE PROHIBITION OF CHEMICAL WEAPONS. Web. Published in 1992. Ivarsson U, Nilsson H, Santesson J.